FORT BEND COUNTY, TX – Fort Bend County Officials and the Emergency Operations Center have been closely monitoring the water level in the Brazos River. 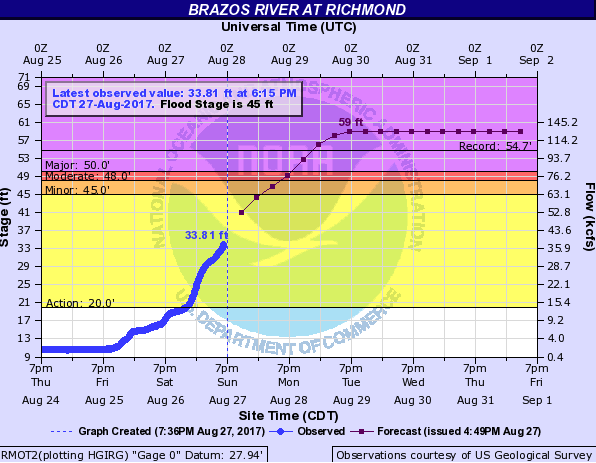 The National Weather Service forecast indicates that the Brazos River will crest sometime Tuesday, August 29 in the late afternoon or early evening at an elevation of fifty nine feet at the Richmond gauge. A voluntary evacuation means that you should consider leaving to head for a safer area. There is a chance that surrounding flood waters may hinder your ability to get in and out of your neighborhood. You may be stuck in your neighborhood for several days. A mandatory evacuation means that there is risk to life and safety as well as property. There is also a risk to the lives of first responders who might be called on to rescue you when the expected danger materializes. During a mandatory evacuation emergency, personnel WILL NOT be able to respond to your calls for help. You will be on your own. You cannot rely on help from others. A mandatory evacuation indicates the possibility of danger to your life. We urge you not to ignore it. If you are in a mandatory evacuation zone, do the smart thing: leave and be safe. Local law enforcement and the Fort Bend County Sheriff’s office will patrol evacuated areas. Also be aware that mandatory evacuation orders are already in place for areas along the Brazos River that were impacted by the Memorial Day 2016 flood, and for low lying areas of the San Bernard River. There are also evacuations in place from the cities of Rosenberg, Richmond, and Simonton and a voluntary evacuation for areas around the Barker Reservoir. If you are in a voluntary evacuation area, be sure you are comfortable staying put for several days and that you have enough food, water and other supplies to last at least a week. As you are aware large amounts of rain have fallen within the Commonwealth subdivision over the past 24 hours. The levee district drainage system remains in gravity flow discharge from Alcorn Lake, meaning the pumps have not yet had to operate. All of the pumps, equipment, and staff are in place and ready to operate as intended as the Brazos river rises. The lakes and detention ponds within the District have adequate storage capacity at this time for the predicted rainfall, and the levee height and pumps should be adequate to handle not only the anticipated rainfall within the District, but also the anticipated rise in the Brazos river. We will notify everyone of any change in circumstances but we should be in good shape to weather this storm. The National Weather Service West Gulf River Forecast Center has issued a forecasted Brazos River crest elevation at the Richmond gage of 59′ (ft) to occur on Tuesday August 29th around 7pm. That would mean a record flood for the Brazos River in Fort Bend County. The First Colony LID#2 levee, which serves the Commonwealth neighborhood, has sufficient freeboard at that forecasted elevation. Staff will be monitoring the levee and conditions 24 hours a day. Please remember that these precautionary measures are not a sign of trouble and is a part of our flood response plan as outlined in the District’s Emergency Action Plan. There will be areas in the county outside of levee protection that will be flooded. If you have any special needs that you feel need to addressed please contact the City of Sugar Land.